The Nokia 5 comes out of a box very similar to the ones of the Nokia 3 and 6 we've previously had for review. In fact, all three phones were together at the office at one point and it would have been a struggle figuring out which goes where, if we could at all be bothered to keep our stuff organized. Point is, the new Nokia is keen on reigniting brand awareness and the retail packages reflect that. Inside the box you'll find the basics - a charger (plan 5V/2A one) and a USB cable, but also a headset. That last piece of smartphone paraphernalia has been disappearing from the retail bundles of budget-minded devices recently, so it's good the Nokia 5 has it. 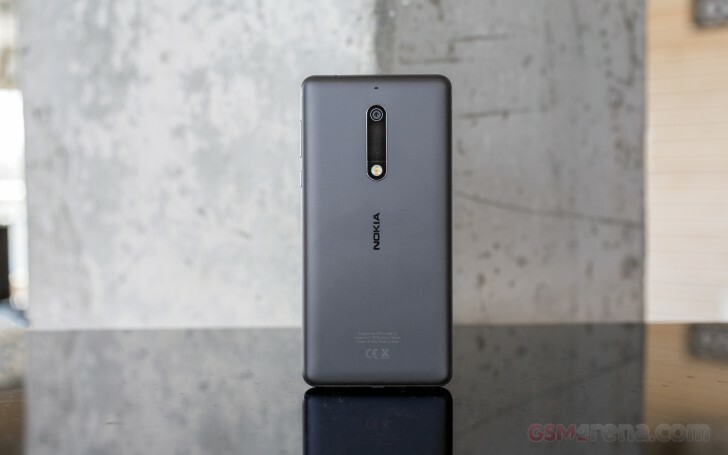 The Nokia 5 measures 149.7 x 72.5 x 8.0 mm, making it a reasonably sized 5.2-inch phone. Samsung's got a bunch of those in its recent lineup and both the Galaxy J5 (2017) and the A5 (2017) are a few millimeters shorter and a millimeter narrower, but the Moto G5 is a fraction of a millimeter taller and 1.5mm wider. The Huawei P8 lite (2017), also known as Huawei P9 Lite (2017), Huawei Honor 8 Lite, Huawei Nova Lite, Huawei GR3 (2017), because Huawei, with its 147.2 x 72.9 x 7.6 mm is shorter but wider - again, not by much. At 160g, the Nokia 5 is on the heavy side of average, but most 5.2-inch handsets are in the 155-161 range, so not really a cause for concern. The J5 (2017) is 160g, the Moto G5 is 155g, the Huaweis listed above are somewhat lighter at 147g - most of them do have 'Lite' in the name, after all. 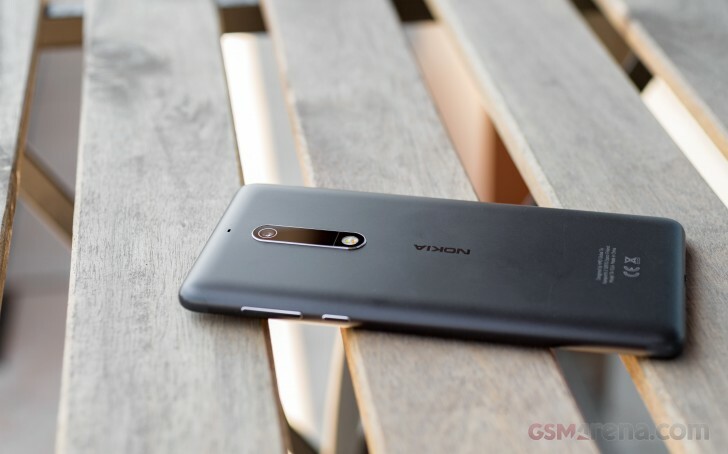 The Nokia 5 is closer to 6 than it is to 3 number-wise, and it shows in the Nokia 5's materials and build quality. We're not ones to immediately dismiss plastic and there was a certain appeal to the simple polycarbonate 3. Metal is metal, though, and the 5 has it. An aluminum unibody like the one of the Nokia 6, only with less striking lines and more curves - the Nokia 5 is a bit more generic. The smooth finish of the back and the rounded edges can only mean one thing, though - the 5 is very slippery, but that's really how aluminum-backed phones tend to be. We're quite pleased with how the antenna inlays are worked into the design of the back, almost making them invisible. Is anyone really a fan of antenna bands being used as accents? We're not as excited about the whole camera/flash assembly - the generous camera lens inlay might be warranted on the rumored upcoming Nokia 8, where there is a bunch of stuff going on such as a dual camera and whatnot, but on the 5? And let's not spare the Nokia 5 our usual complaint about the regulatory markings on the back - the technology exists, get rid of them. 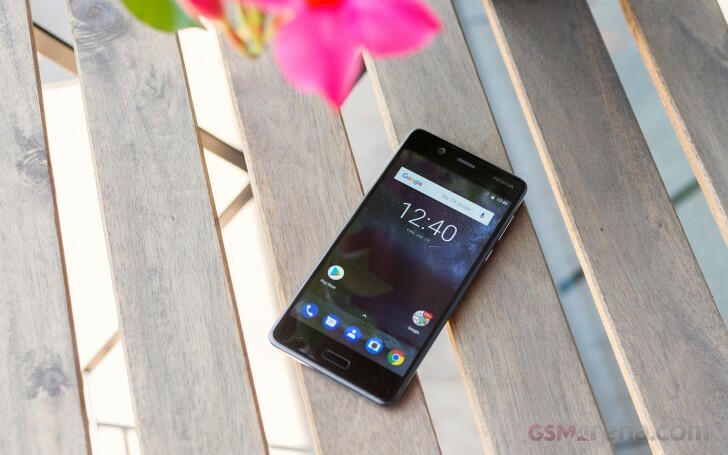 Make sure you don't get this the wrong way, however - we mostly like the Nokia 5's design and build quality, but in typical reviewer fashion, we need to point out the stuff that bugs us. And yes, there's some of it on the front as well. It's great that there's a fingerprint reader on the 5, unlike on the 3. But it's a tiny bit too narrow for our liking. Or is it too low? Or a bit of both? Well, it's a little awkward at first, but not something you won't get used to and forget about a couple of days into owning the smartphone. It also doubles as a Home button - there is no onscreen navigation bar. It's flanked by two capacitive keys, Back on the left, Recents on the right and they light up when tapped. Above the display there's an earpiece slit - sadly, not a second speaker. To its right is the ambient light/proximity sensors cutout (barely visible), while the front-facing camera is on the other side - itself more prominent, perhaps proud of having autofocus. There's no notification LED, sadly. The display glass is ever so slightly curved towards the edges, which makes for pleasant swiping off the edges when you get there. Nokia doesn't specify what generation of Gorilla Glass is on top, but does say there is some. The right side of the phone is home to the power button and the volume rocker. The former is a little on the small side and could have been a millimeter longer, and a few millimeters farther from the volume rocker, but it's no big deal. Both click very positively, which is nice. On the opposite side you'll find the two card bays - one is for SIM cards (or just one SIM card in our case), the other is for the microSD card, which you're going to need in light of the limited internal storage. Dedicated slots are the bomb and we wish more makers would opt for those instead of the hybrid solution where you have to choose either a second SIM of a microSD card. On the bottom of the Nokia 5 is the microUSB 2.0 port - we'll need to wait for the 8 to get a Nokia with a USB-C connector. To one side there's a pinhole for the microphone, and the loudspeaker is on the other side. Up top there's a 3.5mm jack and nothing else. Slipperiness aside, the Nokia 5 feels very nice to handle. Your palms will appreciate the lack of sharp edges and it's a distinctly different feeling compared to the Nokia 6 (which we liked anyway). Meanwhile, the sides provide enough area to grip when picking the 5 off a table. Overall, a very pleasing experience.